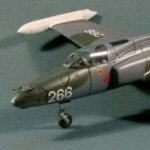 Scale modeling for over 20 years, mainly interested in WWII airplanes in 1/72. My focus is especially on Spitfire, I have over 40 of them in 1/72. Member of Belgrade Scale Modellers Club and IPMS Serbia. Finished some time ago, OOB. Colors are Gunze acrylics, decals from the box, a few things added in the cockpit. I simply love the Airfix Mosquito, somehow it looks just right to my eye. Thanks for looking, comments are always welcome! Big kit of a big airplane. I received a kit from friend, built already. I dissasembled it and cleaned it of old paint, then reassembled and added few details. Painted with automotive paints in a new Serbian AF livery, decals again from Lift Here. Figures, I’d start a new project quickly…..